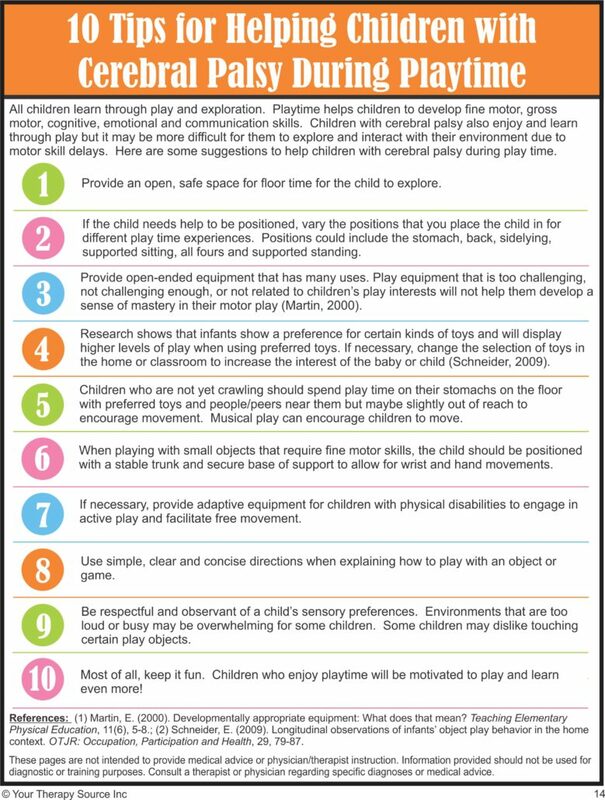 This hand out includes 10 tips for helping children with cerebral palsy during playtime (download below). 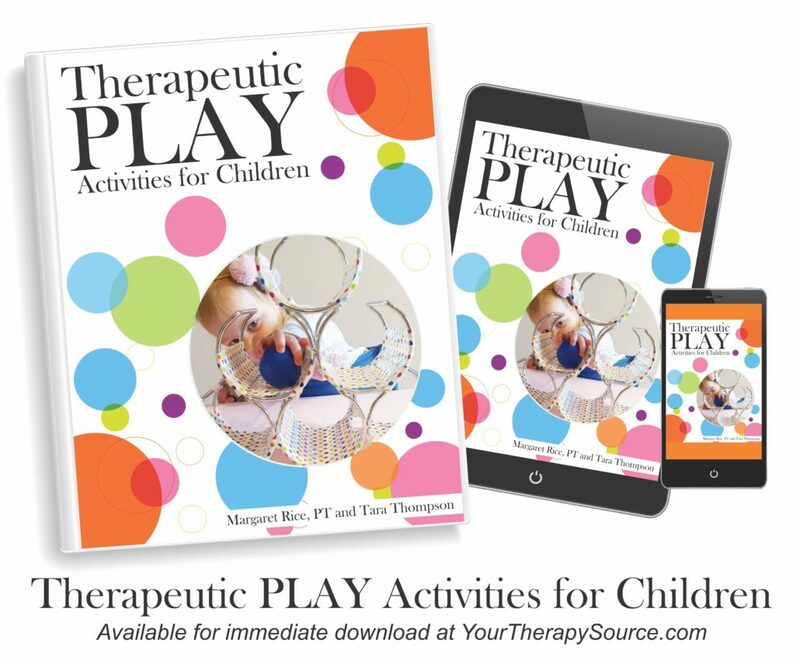 This printable tip sheet is from Therapeutic Play Activities for Children. All children learn through play and exploration. Playtime helps children to develop fine motor, gross motor, cognitive, emotional and communication skills. Children with cerebral palsy also enjoy and learn through play but it may be more difficult for them to explore and interact with their environment due to motor skill delays. Here are some suggestions to help children with cerebral palsy during play time. Provide an open, safe space for floor time for the child to explore. If the child needs help to be positioned, vary the positions that you place the child in for different play time experiences. Positions could include the stomach, back, sidelying, supported sitting, all fours and supported standing. Provide open-ended equipment that has many uses. Play equipment that is too challenging, not challenging enough, or not related to children’s play interests will not help them develop a sense of mastery in their motor play (Martin, 2000). Research shows that infants show a preference for certain kinds of toys and will display higher levels of play when using preferred toys. If necessary, change the selection of toys in the home or classroom to increase the interest of the baby or child (Schneider, 2009). Children who are not yet crawling should spend play time on their stomachs on the floor with preferred toys and people/peers near them but maybe slightly out of reach to encourage movement. Musical play can encourage children to move. When playing with small objects that require fine motor skills, the child should be positioned with a stable trunk and secure base of support to allow for wrist and hand movements. Be respectful and observant of a child’s sensory preferences. Environments that are too loud or busy may be overwhelming for some children. Some children may dislike touching certain play objects. Use simple, clear and concise directions when explaining how to play with an object or game. If necessary, provide adaptive equipment for children with physical disabilities to engage in active play and facilitate free movement. Most of all, keep it fun. Children who enjoy playtime will be motivated to play and learn even more! Schneider, E. (2009). Longitudinal observations of infants’ object play behavior in the home context. OTJR: Occupation, Participation and Health, 29, 79-87.